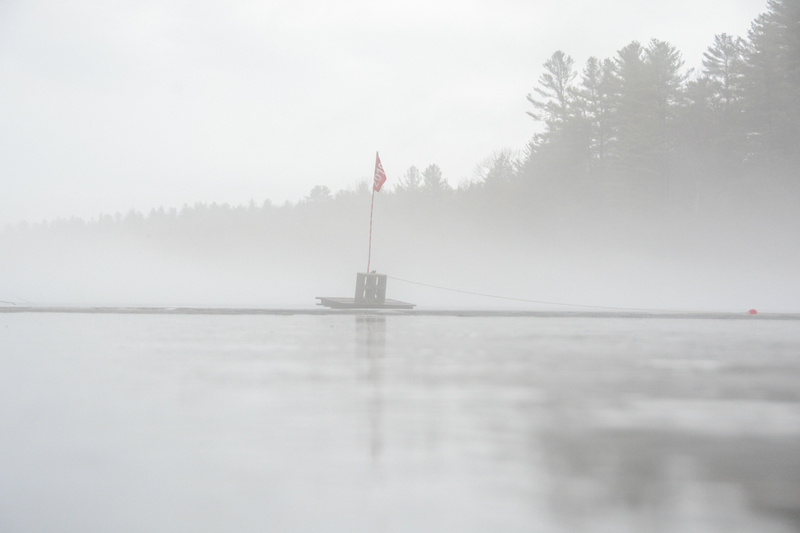 Saturday, April 13th started out with heavy rain and widespread fog. As the warm front that triggered the wet weather passed overhead, clouds started to break up, the winds started to pick up and the sun pushed temperatures into the low 70’s. 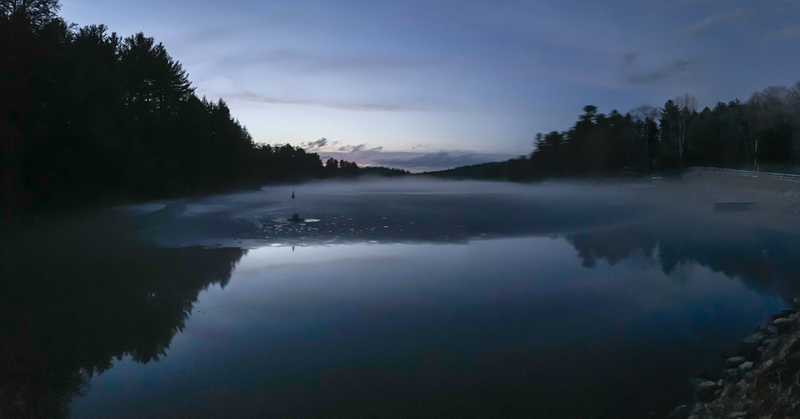 The ice on Hammond Pond was getting darker and growing more translucent – a sure sign that it was getting thinner. I was fairly confident that the block would go down soon so I hooked up my GoPro camera to the gatehouse and started to record. 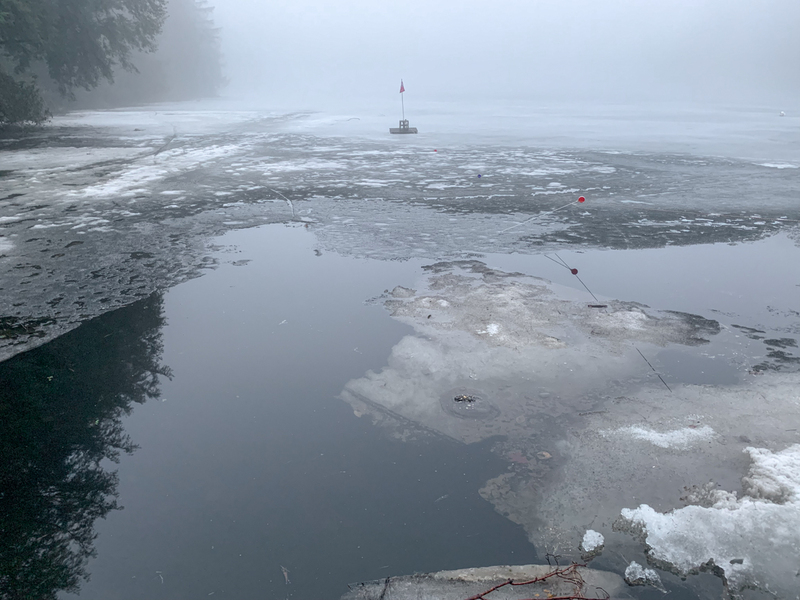 This time-lapse video captures 11 hours of activity on Saturday, April 13th from 8:30AM to 7:30 PM and shows the impact Mother Nature can have on the ice floe on Hammond Pond. As you watch the video, pay close attention to the crack in the ice along the shoreline on the left. It’s amazing to see the impact wind has on the surface of the ice – something our eyes can’t perceive because it happens in slow motion. Condensing 11 hours of video into 3 1/2 minutes brings the ice floe to life. A crack in the ice floe approximately 200′ north of the meltdown block made it easier for the ice sheet to be affected by Saturday’s breezy conditions. The line from the block to the extension cord in the gatehouse can be seen going limp at the 00:51 second mark. 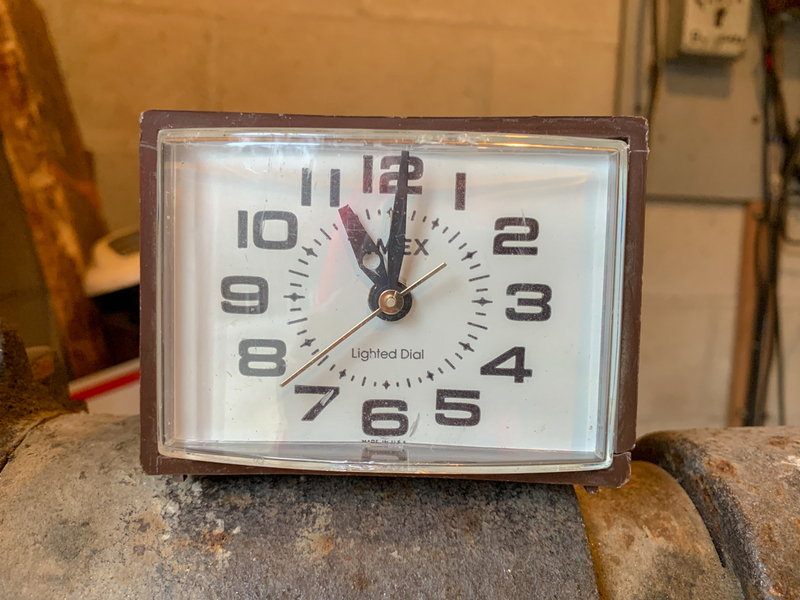 That is the exact time when the tension on the rope was enough to pull the plug on the Timex clock and the 2019 Meltdown came to an end. 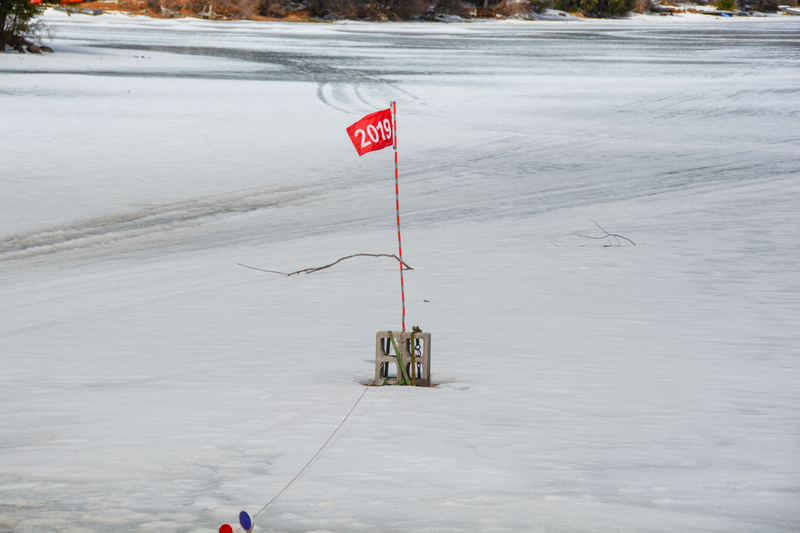 A safety knot on the rope keeps the line from becoming completely submerged and also helps me when I need to retrieve the block for next years contest. 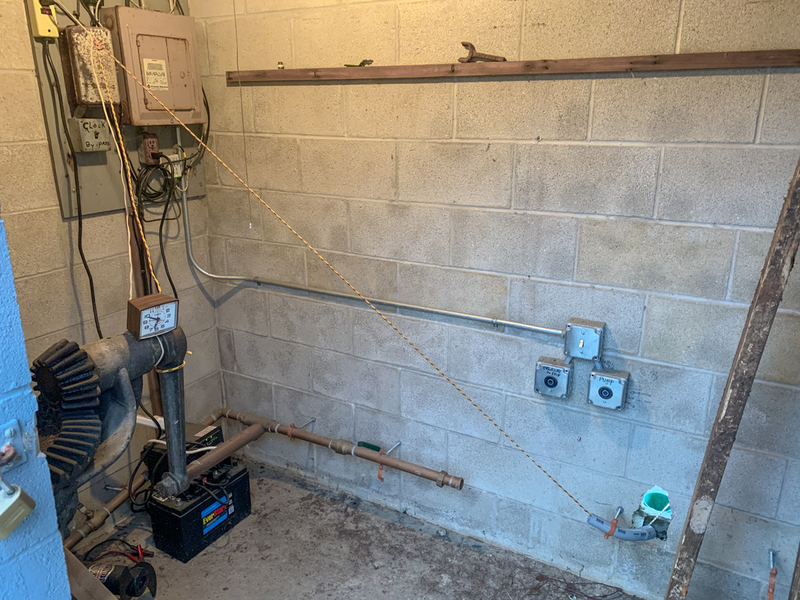 That’s why you see the rope continue to raise and fall even after the clock extension was pulled from the outlet. 59% of picks were for before 4/13 at 11 AM. 31% of picks were for after 4/13 at 11 AM. 34% of picks fell in the morning while 66% of picks were for times after noon. After keying in the 1,178 tickets into an excel spreadsheet, I sorted the data by date and time then scrolled down to 4/13. Ron Charbonneau, Ron Wozniak and Chet Gorski had picks of 11:11 AM, 11:35 AM and 11:37 AM respectively. However, since we go by the Price is Right rules, it’s the person who is closest to the exact time the plug gets pulled without going over that wins. Charlie Lotspeich / Phyllis Woolf, Jon and Christine Sass and Margaret Tantillo had picks of 10:30 AM, 10:19 AM and 10:00 AM respectively. For that, they get an honorable mention and my eternal gratitude. This is where things get a bit strange. My spreadsheet showed 11 picks for 4/13 at 11:00 AM. However, those 11 picks were by two people. So, for the second time in the history of the Meltdown contest, we have two winners. Linda Tucker of Springfield and Raymond Gagne of Southampton both picked 4/13 at 11:00 AM. Total proceeds from this years contest were $1,001.22 ($1,178 less 5% taxes to the State of MA and marketing expenses for the contest). When I called Linda to tell her she won, she explained that another supporter of the Meltdown that she works with (Sarah Christenson) was encouraging her to participate. Knowing the deadline was near, Sarah pushed Linda for her picks. Linda gave Sarah $20 and told her to apply 4/13 at 11AM to 10 tickets and donate the remaining $10 to the cause. As a result, Linda will be receiving a check for $455.10 (10/11ths of $500.61) . When I called Raymond Gagne, I told him I had some good news and some bad news. The good news is that he had won the 2019 Meltdown. The bad news is that he had to share it with someone else and that he would be receiving 1/11th of the pot or $45.51. We had a good laugh and what had transpired. Raymond was still happy that he won and said he would take his winnings and buy more tickets with it next year. As has been the case in years past, we received an additional $240 of straight donations to the contest. 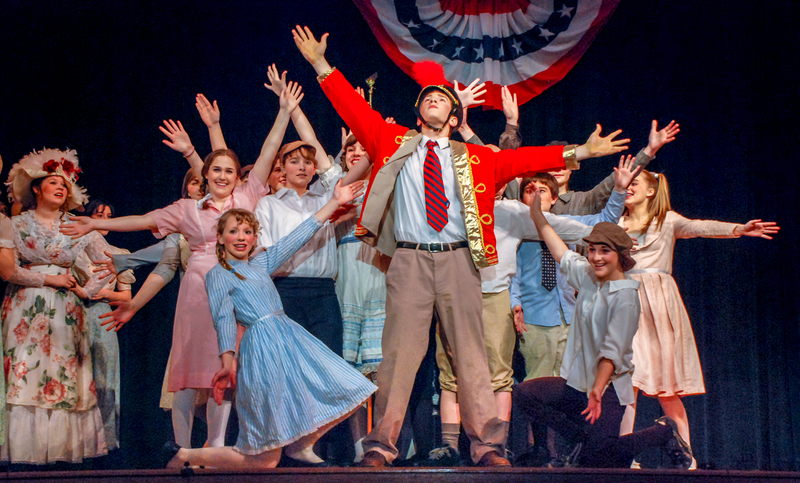 As a result, the Hampshire Regional High School Musical Theater Scene and Heard campaign will receive a check for $740.60 (50% of the proceeds of $1,001.22 plus $240 in donations). The calendar may say April 9th, but the weather forecasters are still using terms like ‘bomb cyclone’ to describe the snow storm and expected blizzard conditions now bearing down on the midwest. Here in the northeast, dense fog would be the appropriate description of what we’re experiencing. This is what the block looked like tonight (as of 04/09/2019). 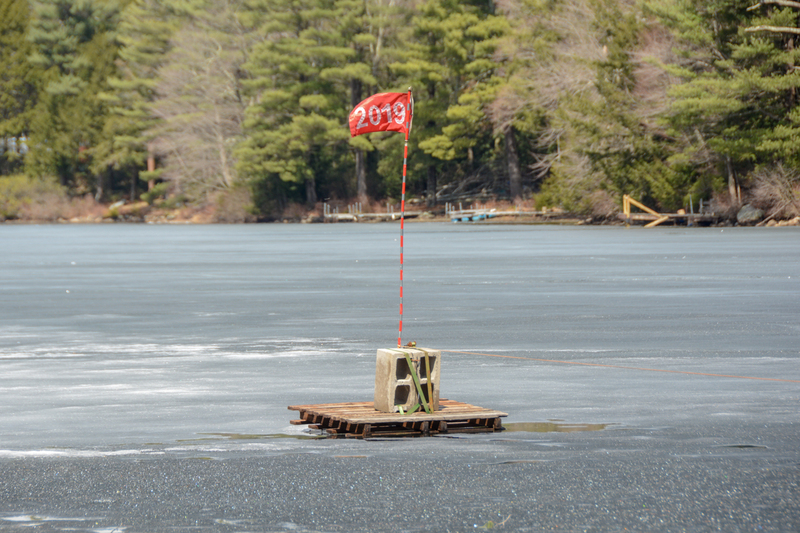 Now for the part that’s not a joke and even though we had snow last Friday, the weekends bright sunshine coupled with 60 degree temperatures really took its toll on the ice on Hammond Pond. Anyone up for a swim? (as of 04/09/2019). Here's what the inside of the gatehouse looks like (as of 04/08/2019). 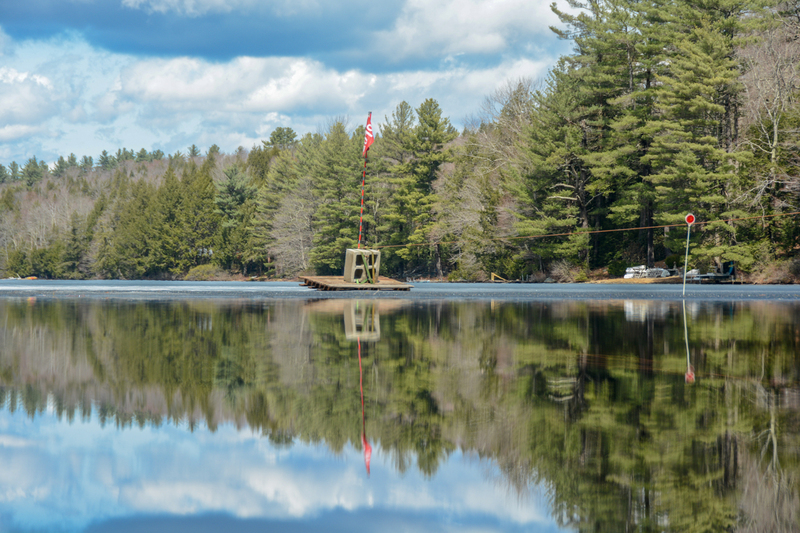 As a result, the clock is now hooked up in the gatehouse on the Hammond Pond dam. If you look closely, you can see where the rope that’s attached to the block comes into the gatehouse in the bottom right of the above picture. From there, it’s tied to the power cord of the Timex clock that’s plugged into the electrical outlet on the wall. 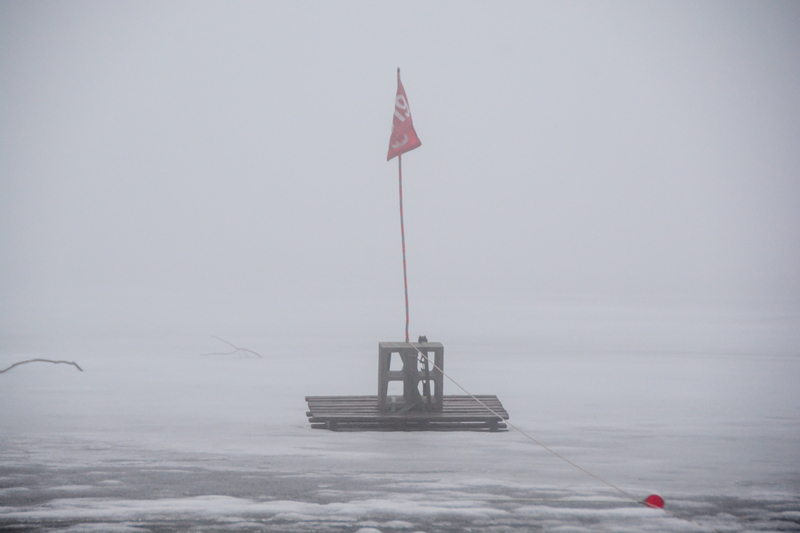 When the block falls through the ice, the tension on the rope will pull the plug on the contest. Friday's snowfall came as a surprise to many (as of 04/05/2019). This is the time of year where weather can be below freezing overnight and soar into the 60’s and 70’s when the sun comes out. One sure sign of spring is the ice cream cone cutout out in front of the Village Green in Williamsburg with a big sign on it that simply says “Soon”. 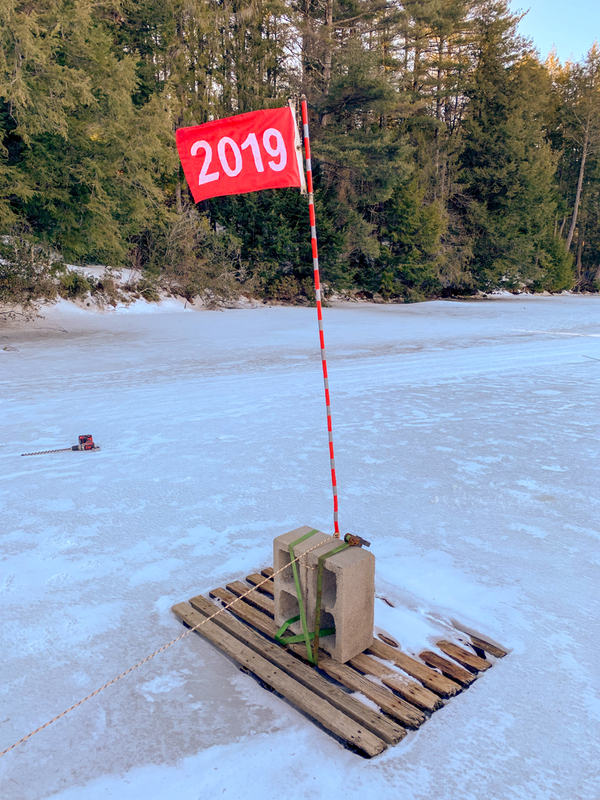 The snowfall wasn't enough to re-freeze the areas of open water (as of 04/05/2019). 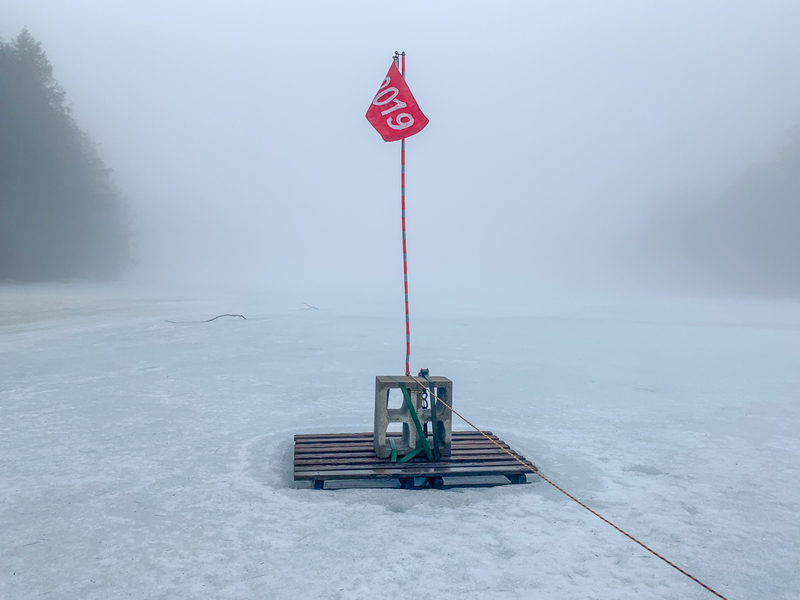 It's safe to say that I won't be going out on the ice to take measurements anytime soon (as of 04/07/2019). Those aren't spots on my lens. Those are snowflakes (as of 04/05/2019). If anyone needs me over the next few days, I’ll be busy at my computer entering in all the ticket submissions that made it to me last week. If there’s one thing I can count on, it’s the flood of tickets I receive the week before the deadline. 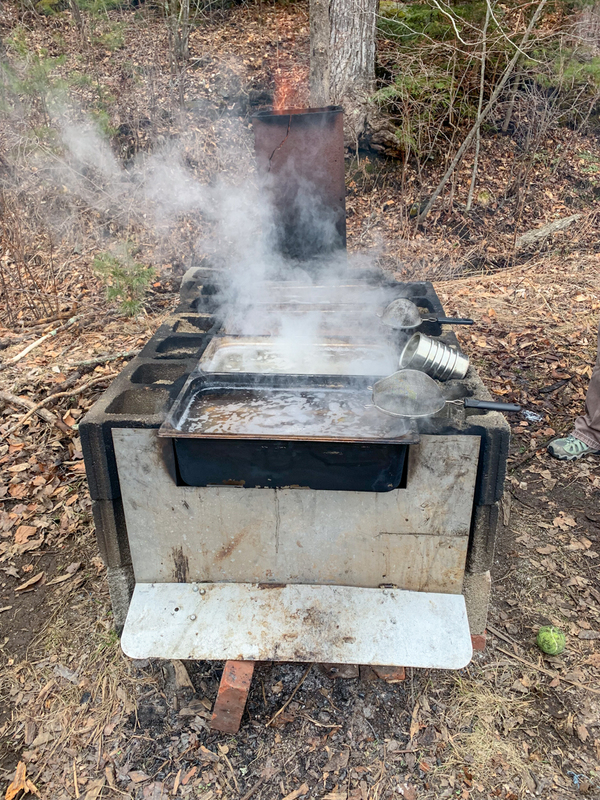 Each year, a true sign that spring is just around the corner comes in the form of steam rising from sugar houses that are scattered throughout western Massachusetts. 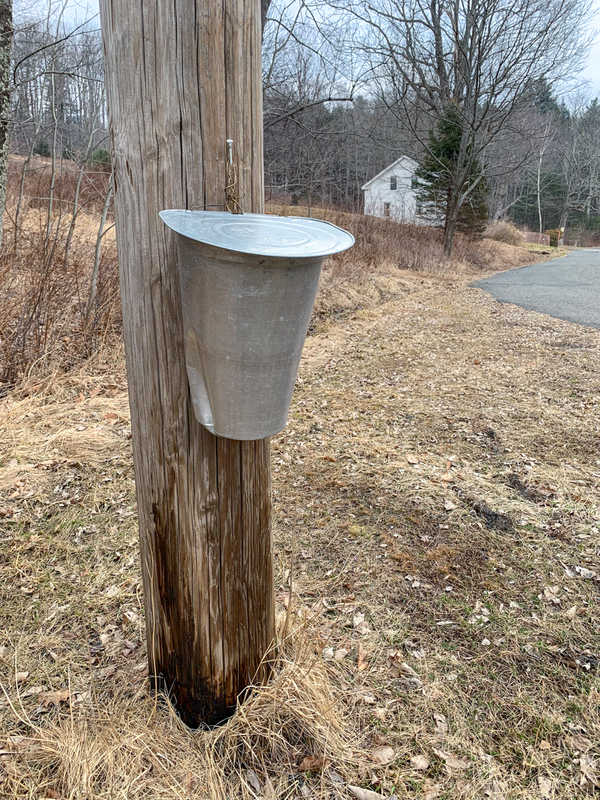 What many folks may not be aware of is that local utility poles are fast becoming a dependable source of the New England delicacy – utility syrup. Surprisingly, there are 3 different species of utility poles that can be tapped for syrup. Each produces a product with a slightly different flavor profile. The differences are subtle, and the species has less to do with the final flavor than other seasonal and local factors. A few years ago when Vermont introduced new and less confusing guidelines for syrup grading, most syrups would be lettered “A” along with more descriptive names. Here in the Hilltowns of western Massachusetts, locals secretly got together and came up with their own naming convention for utility pole syrup, which not surprisingly, would start with the letter “U”. A typical utility pole tap. For example, Transmission poles which carry high voltage electricity from a source to a substation would be labeled U – T – Electric Blue and Delicate Taste. Distribution poles are a little more complicated because some are self-supporting, while others require a guy-wire to hold them up. Product from self-supporting poles are labeled U – D – SS – Shocking Color and Robust Taste. Product from guy-wire supported poles are labeled U – D – GW – Grounded Color and Robust Taste. The third category of utility poles are called Light / Traffic poles. As the name implies, these poles support streetlights, traffic signals and other equipment like transformers. Since these poles typically don’t do much, it takes more time and effort to create product. The syrup produced from these poles are labeled U – D – LTP – Ground Dark and Strong Flavor. Taps on maple trees may soon be a thing of the past. As many of you know, a good number of Hilltowns are in the process of building brand new Broadband internet networks using fiber optic technology. As part of the make-ready work before the fiber can be strung, utility poles are inspected to determine if they are capable of carrying another strand of cable. This project has proven to be a boon for local sugarers when poles need to be replaced. New poles allow for for fresh new taps to be drilled. New poles are also safer because of the wood preservatives used on them. It’s been scientifically proven that poles treated with pentachlorophenol (a.k.a. Penta) produce a much lighter golden color. Older poles which were preserved with creosote and chromated copper arsenate (CCA) produced a very dark gold syrup. For those of you who made it this far, congratulations. I hope my annual April Fools story made you think just a little bit before you realized today’s date and then smiled. And now back to the contest. The deadline for ticket submissions is TODAY April 1st at 11:59:59PM. For those of you who have waited until the last possible day to participate, hope is not lost. Anyone who e-mails me their picks before today’s deadline and follows up with their donation in the next couple of days will still be part of the pot. Do it now and help me usher in spring! 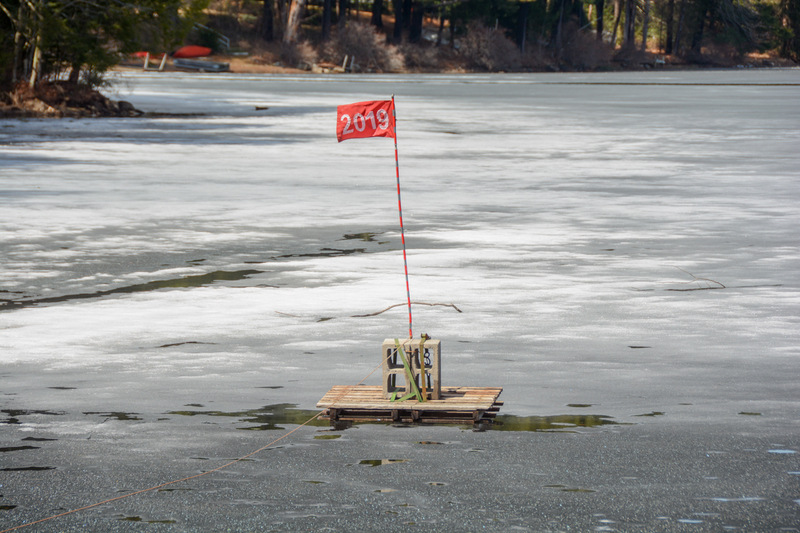 With only a few days left to get your tickets in, the ice is thick and is still clinging to the shoreline. While today will be the warmest day of week, the forecast calls for colder air, along with rain, moving in tomorrow morning. Those warm temperatures are waking up the trees. First came the sap in the maple trees. Now, forecasters are indicating that tree pollen levels are high. It won’t be long before our cars are coated in a powdery yellow layer of it. We’ve turned a corner in the weather department. As the sun climbs higher in the sky, its impact can be felt and seen on the ground. The daffodils at the Goshen fire station are sticking up out of the ground by about 3″ while patches of brown grass emerge from their melting snow blanket. The ice on the water at the Oxbow in Northampton will be all but gone by this weekend and the welcome sound of morning birds now fills the air. 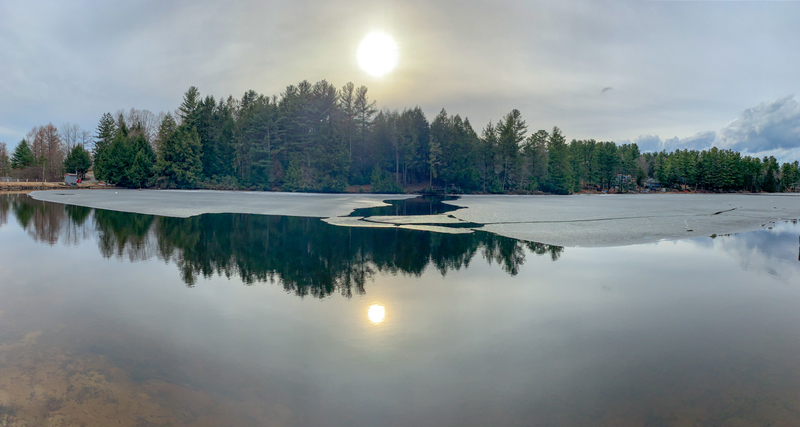 Any snow that used to cover Hammond Pond has now melted leaving a water clogged surface that freezes over every night and melts during the day. 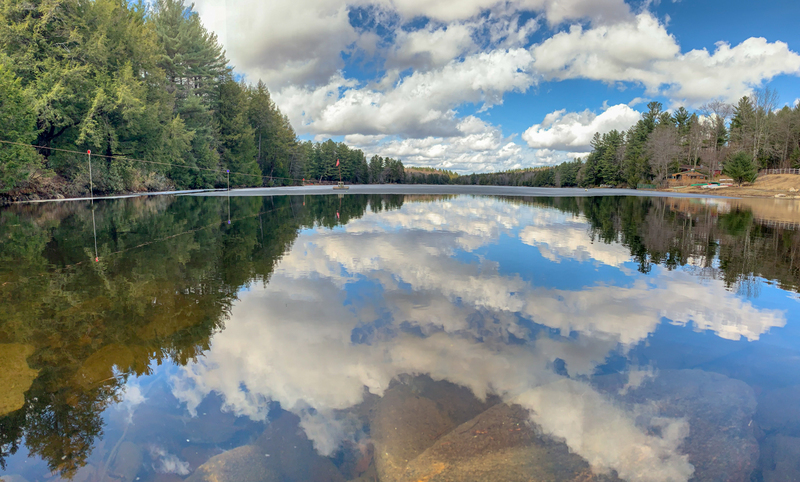 Hammond Pond is fed by Webster Brook. The ice starts to melt from the northern end of the pond and migrates towards the dam located at the southern end of the water body. The meltdown block and flag are located is a shady area approximately 100′ from the southern shore. While there is open water visible at the Webster Brook inlet, it still has a long way to go before it reached the block. I took a walk in the hemlock grove behind my house today and was somewhat surprised to find 6″-10″ of snow on the ground. 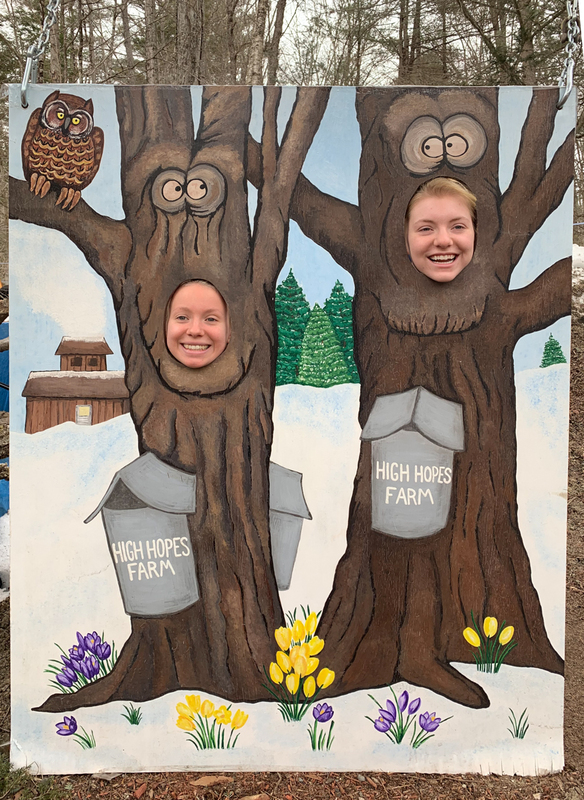 The Vernal equinox occurred this past Wednesday at 5:58 p.m. Two days later, Goshen received another 2″ of snow as a reminder that we live in the Hilltowns and Mother Nature still calls the shots in spite of the calendar. 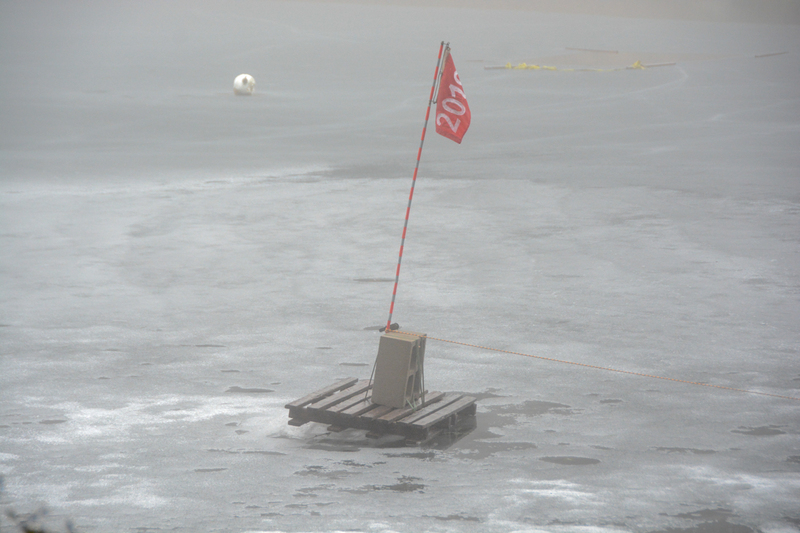 I went out on the ice yesterday with my 14″ drill bit to measure its thickness. I could tell by how easily the 14″ drill bit slides through the first 10″ of ice that is was fairly soft. Then, it was like I hit concrete because it took all my strength to get it to go another 2″. 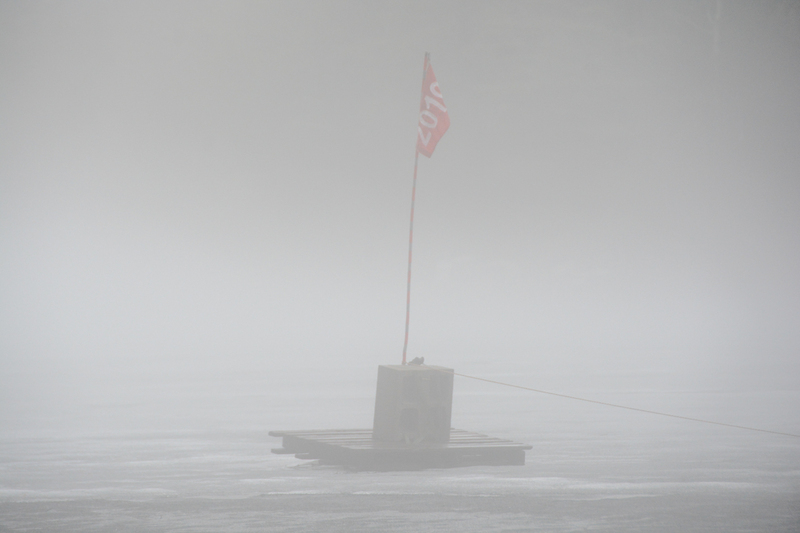 I tried drilling in another spot and got the same result – soft ice on the top then a layer of very hard ice. Suffice it to say that the ice is still well over a foot thick. I’ll have to bring my chain saw out there this week to determine if it’s more than 18″ thick – the measurement we took just over a month ago. Temperatures last weekend soared into the 50’s. However, when there’s still a foot or more of snow on the ground and snow banks twice as high on the sides of the roads that can only mean one thing…mud season. I think it’s safe to say that there’s not one person that lives on or drives on a dirt road that looks forward to this time of year. One of our local television stations even made a story out of it that they called “Mud season leading to hard-to-pass roads in rural areas of western Massachusetts“. 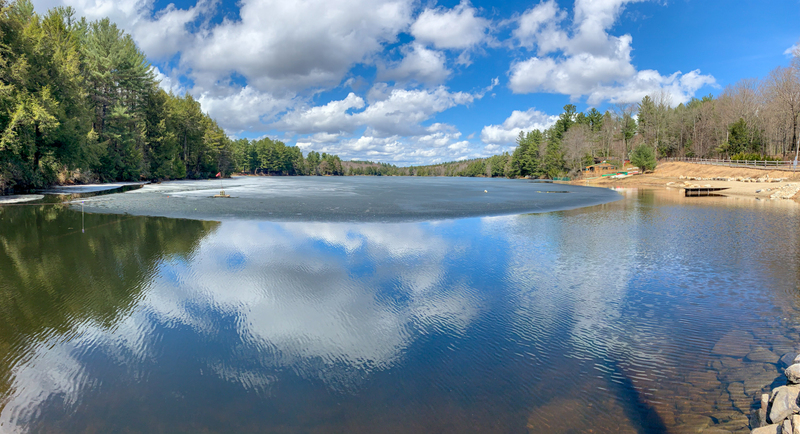 As you can see from the picture above, the melting snow caused puddles to form on top of the ice on Hammond Pond. Another interesting result of last weeks warmth was a significant runoff from the road that found its way to Hammond Pond. This is not something that I recall seeing in the past. As you can see from the picture above, the muddy runoff accumulated in an area between the gatehouse and the block. What concerns me is that the dirt particles in the runoff are now sitting on top of the ice floe making that section darker. A darker surface absorbs the rays of the sun. The question is, what impact will that have on the block? Only time will tell. When are Canadian Geese Not Canadian Geese? I stand corrected and I appreciate you keeping me honest. However, if you listen close enough, the Canada Geese up here do have a slight french accent. The reason I know is because they’re starting to make quite a ruckus in the wetlands that Hammond Pond empties into. March 14, 2019 - Can You Feel It? 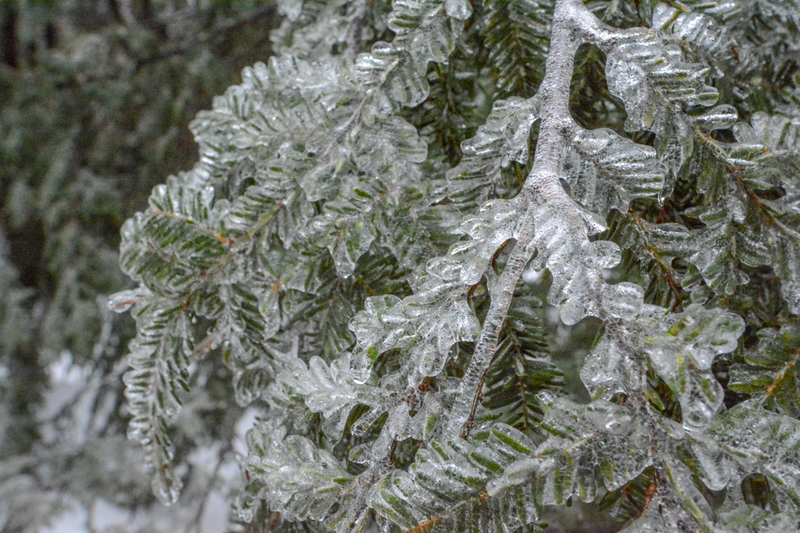 Over the past several weeks, we’ve shivered from below zero temperatures, been blown over because of high winds, slipped on ice laden driveways, and gotten drenched from pounding rain and blowing snow. In the coming days, we’ll feel warming temperatures, see melting snow and have trouble finding our way through the dense fog. It’s been a few weeks since we kicked off this years contest so let’s do some catching up. 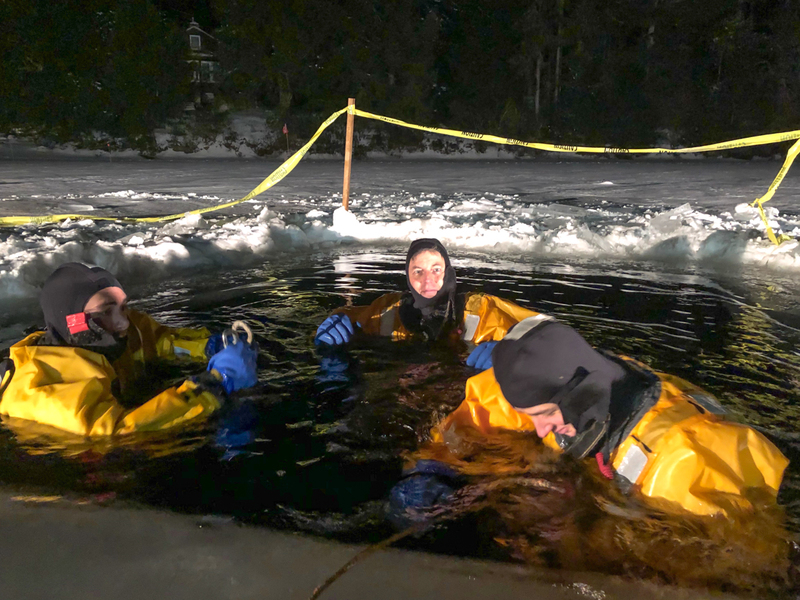 On February 19th, members of the Chesterfield, Goshen and Williamsburg fire departments conducted their annual ice water rescue training on Hammond Pond. 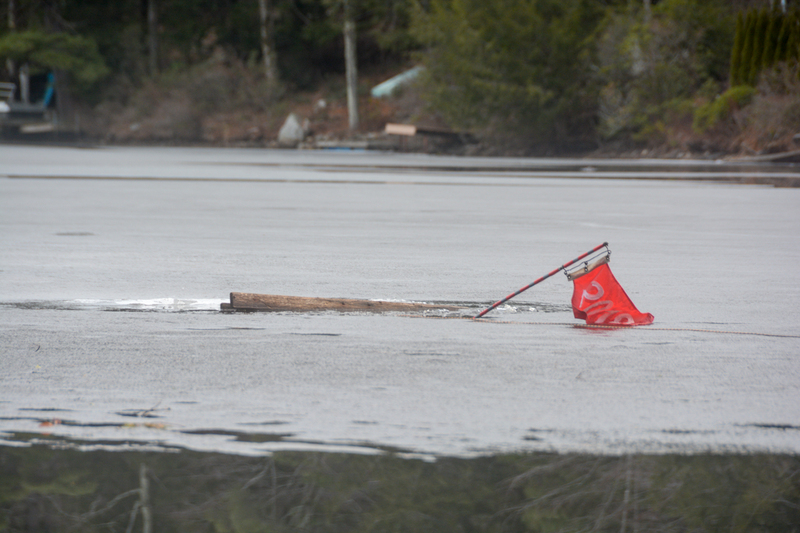 A hole was cut in the ice to make an area large enough for several rescuers and ‘victims’ to go swimming. 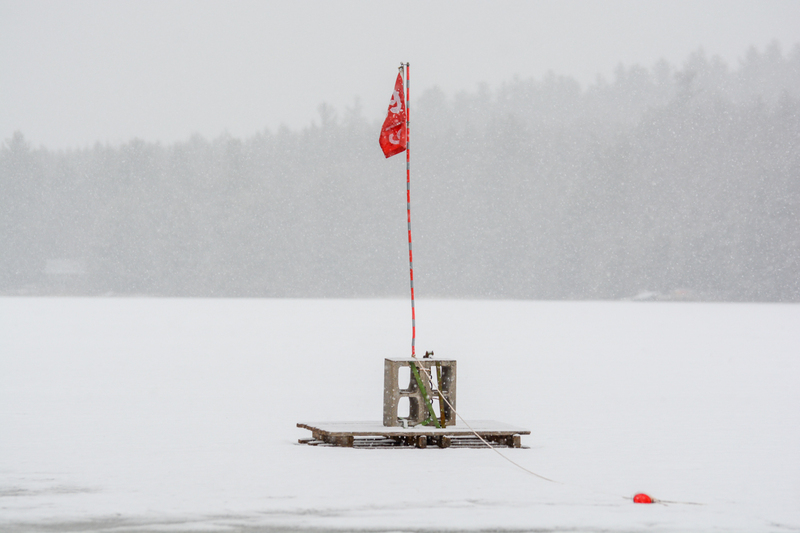 Lucky for us, we had a 20″ bar on the chain saw that sliced through the ice which measured 18″ thick. If you look closely in the background of the picture, you’ll be able to see the meltdown flag off in the distance. By the way, that would be me in the middle of this picture. On February 25th, the second anniversary of the date on which the earliest tornado recorded in Massachusetts history touched down in Goshen, the region found itself buffeted by high winds. The National Weather Service issued a High Wind warning for the entire region and for good reason. Not one hill town was spared as people traveling our roads needed to take detour after detour to make it to their destinations because of downed trees and power lines blocking their paths. As you can see from the photo below, East Street in Goshen was only one of many roads that were impacted. 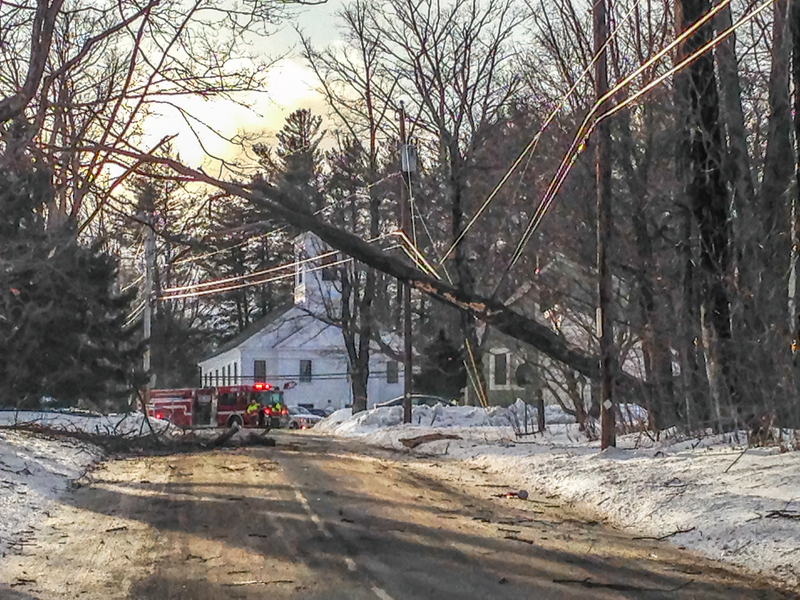 This incident cause a power outage that impacted close to 100 homes in town for several hours. While I can’t tell you which dates she picked, I can say that it’s easy to recognize people that have played the game for years. Their picks are usually in the ball park. Speaking of ball parks, the Boston Red Sox play their first regular season game against the Seattle Mariners two weeks from tonight at Safeco Field. Green grass and the Green Monster won’t be far behind. Today brought temperatures ever so close to the 50 degree mark. Tomorrow’s forecast calls for showers for most of the day with temperatures in the mid-50’s. There’s still a thick layer of snow insulating the ice that stretches from shore to shore. 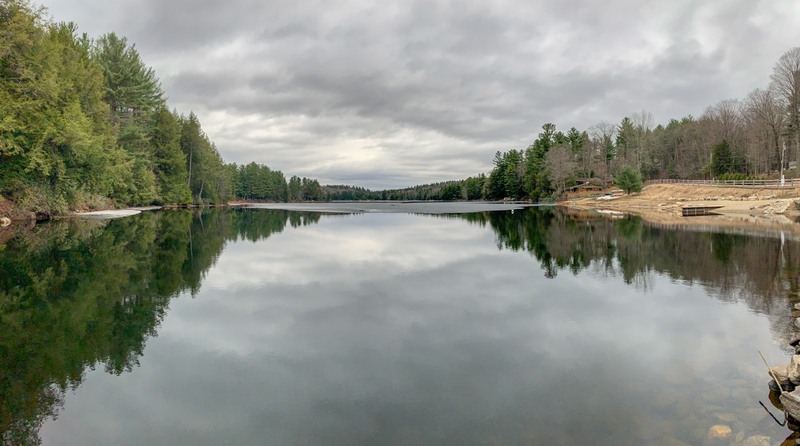 Other signs of spring are the Canadian geese that are migrating north and finding no open water to make a splash in, sugar shacks are boiling an overabundance of sap and for the first time in four years, Lake Champlain is frozen over – just like Hammond Pond. 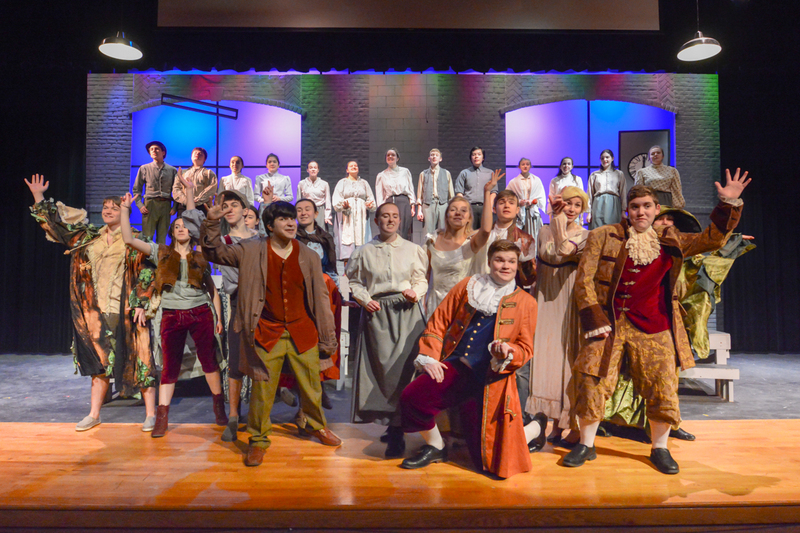 The cast members of the 2019 HRHS Musical "Into the Woods"
For those of you who enjoy drama, a reminder that Hampshire Regional High School is presenting Stephen Sondheim’s musical “Into the Woods” this weekend starting with Friday night’s performance at 7PM. 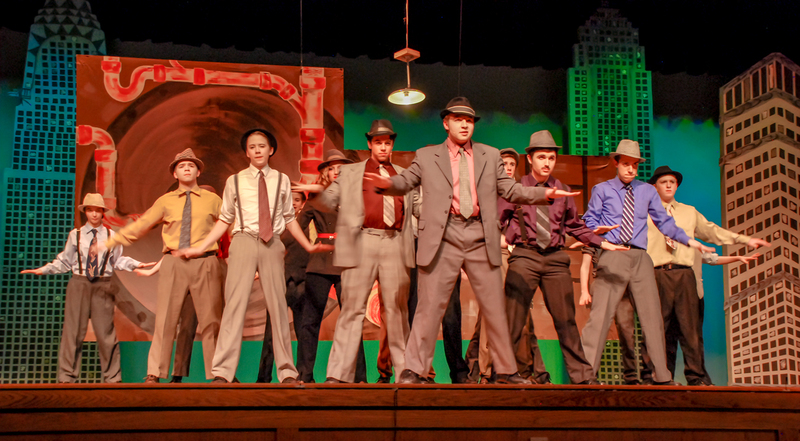 Saturday’s performance is also at 7PM while Sunday’s show begins at 2PM. Tickets for the show can be reserved by emailing hrhstickets@gmail.com or by calling 413-437-5587. Tickets, if the shows aren’t sold out, can also be purchased at the door. I’m preparing a nice surprise for theater goers that will surely be a crowd pleaser. 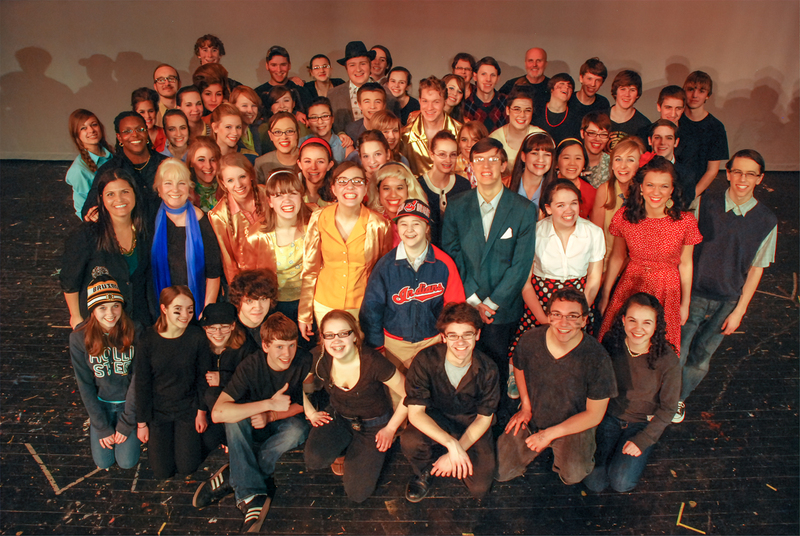 As a reminder, the beneficiary of this years Meltdown contest is the Scene and Heard capital campaign for the high school’s drama program. Hampshire Regional High School (HRHS) serves the towns of Chesterfield, Goshen, Southampton, Westhampton and Williamsburg. 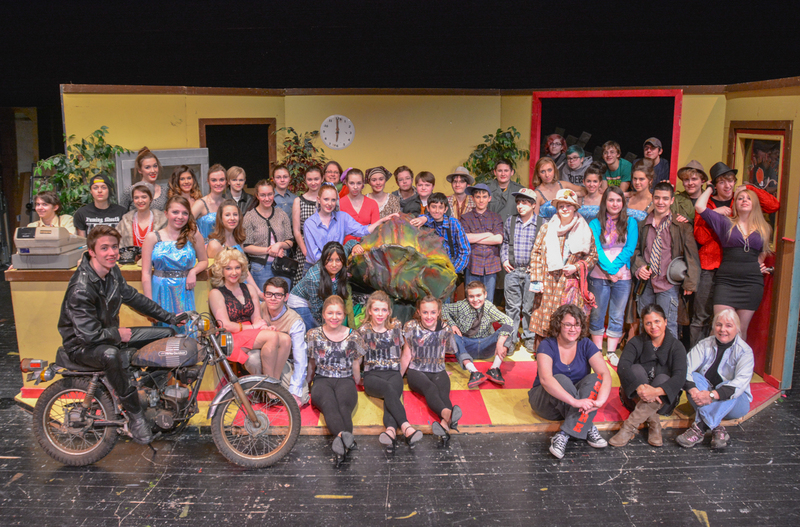 Since our first production of Fiddler on the Roof in 2008, an enormous amount of student, school and community effort has been used to produce some of the best high school musical theatre in the region. The educational benefits are profound and with life-long impact. We – and all those before us who put their time, donations and sweat equity – are immensely proud of raising resources and making magic out of what we have. And we need to address some doable yet impactful changes. All of these still require volunteer time and labor in addition to money raised to make it happen and include lighting, microphones, flooring and sound fixes. During shows, when there aren’t enough mics, or a light can’t reach the action, our kids literally, can’t be seen or heard. The fan cooling the electrical closet (poor original design) drowns out sound making it hard for the actors to hear on stage and can compromise the sound pickup on mics. Adding marley flooring would be that much better to support movement theatre in all its potential. And finally, the drama room needs a facelift capable of keeping the resources organized and the room accessible. 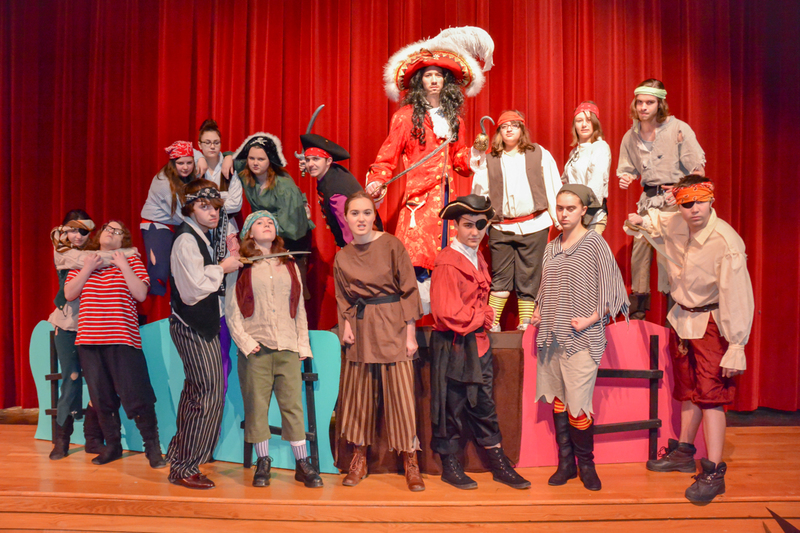 Our total need is $21,600 which would help purchase twelve body microphones, two moving lights, flooring and construction fixes for the electrical closet and drama room. 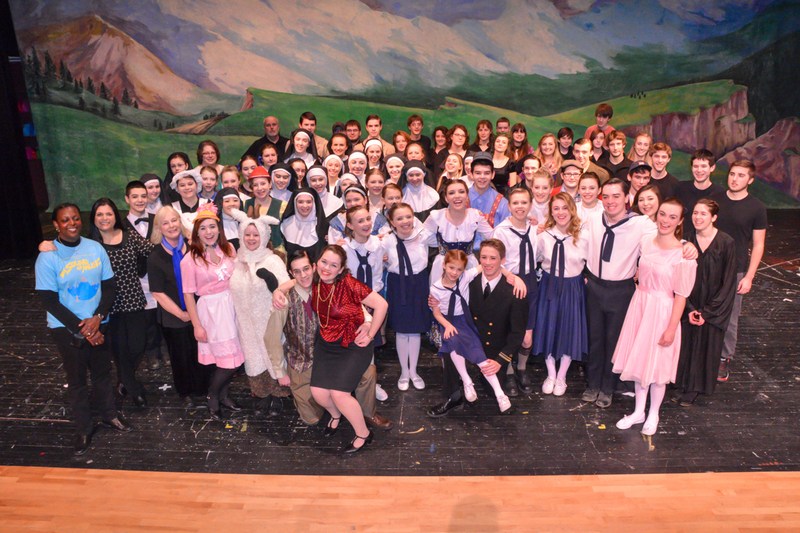 If you already support our musical theatre program though advertisements and other ways, THANK YOU! We are asking for one-time contributions of any size for this campaign to help our kids be seen and heard in ways that will benefit the next generation of emerging artists on and off stage. 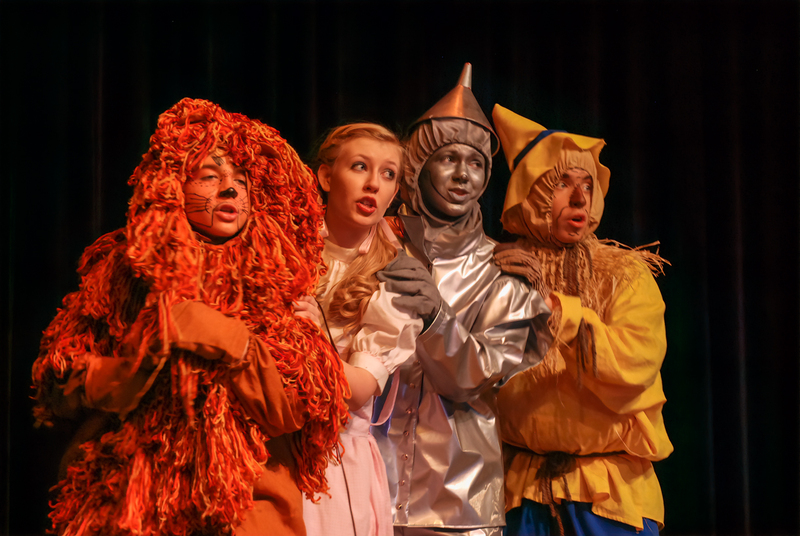 All contributors will be listed in a special thanks on social media and in the program for our upcoming production of Into the Woods, where your support can be seen and heard in the communities where you and your businesses thrive. Checks can be made out to HRHS.